Will Le Corbusier's Chandigarh Fall To Ruin? But now the city is in danger. Rampant development just beyond city limits threatens to overwhelm Le Corbusier's vision for the carefully planned city, though infrastructure and space shortages indicate Chandigarh is in need of an upgrade. The buildings and monuments of the Capital Complex have fallen into disrepair due to air conditioning and weathering. If it wants to save Chandigarh, the government must somehow balance development pressures with preservation. Le Corbusier's masterplan. Image courtesy of Fondation Le Corbusier. The beginnings of this from-scratch city derive from the loss of Punjab’s former capital city, Lahore, to Pakistan following the partition of India in 1948. India’s first Prime Minister, Jawaharlal Nehru, made the construction of a new, modern provincial capital a priority, and enlisted Albert Mayer and Matthew Nowicki to draw up a masterplan for a city of 500,000 inhabitants on a 44-square-mile swatch of countryside in the Himalayan foothills. Before the plan could be implemented, however, Nowicki was killed in a plane crash, and the government turned to Le Corbusier instead. A model of Chandigarh. Image courtesy of Fondation Le Corbusier. Le Corbusier based his own plan on the work previously completed by Mayer and Nowicki, but he made the street grid more orthogonal and created a hierarchy of road systems ranging from arterial roads to neighborhood streets and pedestrian walkways. Corbu not only designed the flagship buildings for the Capitol Complex, but also commercial buildings, a museum, lakes, and parks, as well as an architecture school. The city was expanded several times as Punjab was partitioned once again, this time into the Hindi-speaking Haryana state and the Punjabi-speaking Punjab; Chandigarh did double-duty, serving as the capital city for both. Le Corbusier's High Court Building. Images above from Flickr. This balancing act, one that has worked since the second partition in 1966, is now in danger of tearing the city apart. The government of Punjab plans to build a “New Chandigarh” in the existing district of Mullanpur, which borders the city. Mega-projects planned for this new-new town would include an “Eco City,” a “Medi City,” and an “Education City,” among others. Initial drawings and renderings of this development indicate a typical hyper-commercial center, with mirrored-glass skyscrapers and vaguely Neoclassical villas—quite a departure from Corbu’s vision. Sample designs for New Chandigarh. The developer's website. Sharma also worries that the Capitol Complex is falling into disrepair. UNESCO considered adding Chandigarh to its list of protected sites but did not end up doing so. 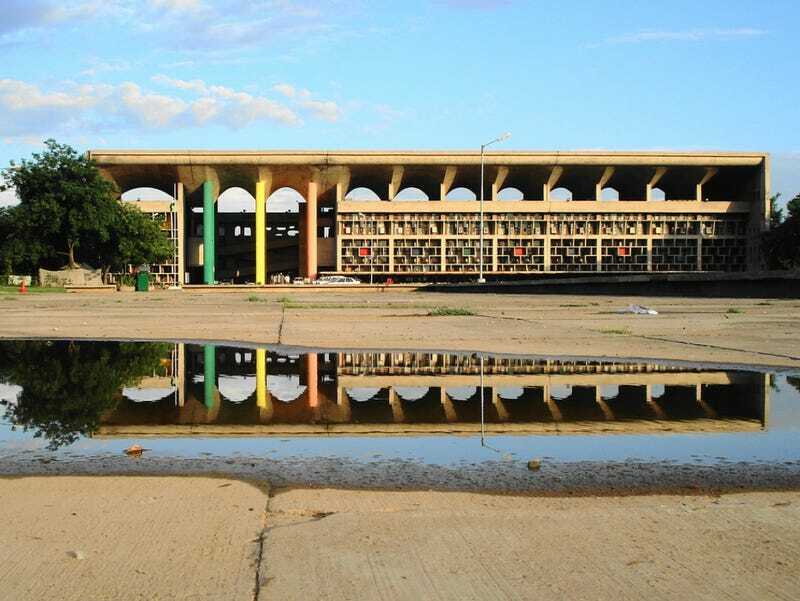 Recent debacles include a judge ordering a hole cut into a Le Corbusier tapestry in order to install air conditioning, while the giant pools outside of the High Court Building lie dry and unable to help with evaporative cooling. Additionally, tourist visits to the city are dropping off precipitously, as officials make it harder and harder to visit the Capitol Complex, requiring a tedious, roundabout paper-stamping procedure. Chandigarh is a unique and beautiful city, worthy of preservation. New Chandigarh and the decreasing appetite for restoration and repair, however, place the city in danger of losing its sublime architectural heritage.